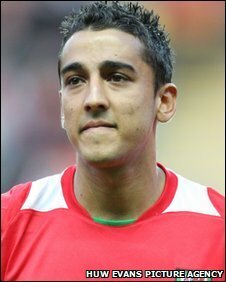 Wales international Neil Taylor has signed a three-year deal with Championship side Swansea City. The 21-year-old left-back was out of contract at Wrexham, although the Swans will have to pay compensation to the Dragons as Taylor is under 24. Taylor made his Wales debut in May's 2-0 friendly defeat in Croatia, coming off the bench for the last half-hour. Taylor was recommended to Swansea by their coach Alan Curtis, who worked with Taylor in his Wales Under-21 role. Former Manchester City trainee Taylor is Swansea boss Paulo Sousa's fourth squad addition of the summer, after the capture of Aldershot's Scott Donnelly and offering senior contracts to youth products Lee Lucas and Daniel Alfei. Taylor, born in St Asaph in north Wales, rejected a move to another Championship club in favour of Wrexham's Welsh rivals Swansea. "I'm delighted,'' Taylor told the Swansea website. "I think I've been linked with the move since Christmas, which is a long time. "I've tried to concentrate on my football with Wrexham, but Swansea has obviously been on my mind, especially when I've linked up with the Swansea lads on Wales duty. "I've spoken in length to the likes of Joe Allen, Shaun MacDonald, Jazz Richards, David Cornell, Casey Thomas, David Cotterill and Ashley Williams. They've had nothing but good things to say about the club. "Not that I needed much persuasion because every time I've seen Swansea they play some great football. "It's exciting to be part of it and I'm looking forward to learning off a manager like Paulo Sousa, who has done it all as a player. "The club has proved they are willing to give young Welsh players a chance in the first team. There is a great Welsh connection here and the stadium looks fantastic. "I can't wait to get started. I realise it's a step up from League Two and the Conference, but I am confident of doing well in the Championship. BBC Sport understands the Swans will have to pay in the region of £40,000 to Wrexham in compensation for Taylor, who will replace Fede Bessone after the Argentine left-back signed for Leeds United earlier this month. Taylor, who has graduated through the Welsh youth set-up and won 10 Wales Under-21 caps, was heavily linked with a move to Swansea in January before he was hit by injury. The left-sided player was then called up by Wales manager John Toshack and made his senior international bow in their defeat in Osijek. Swansea are renowned for their thrifty approach in the transfer market and not spend above their means, a philosophy that their transfer dealings this summer seem to back-up. Swans legend and first team coach Curtis, the former Wales international striker, is one of Welsh youth guru Brian Flynn's assistants and has worked closely with Taylor since he broke into the Welsh youth ranks in 2005. One of Taylor's standout Wales Under-21 displays was at Swansea when he was in the team that beat Italy 2-1 at the Liberty Stadium in September 2009. Taylor has played more than 75 games for non-League Wrexham and, although primarily a defender, likes to get forward and has often been used in a left-midfield role.